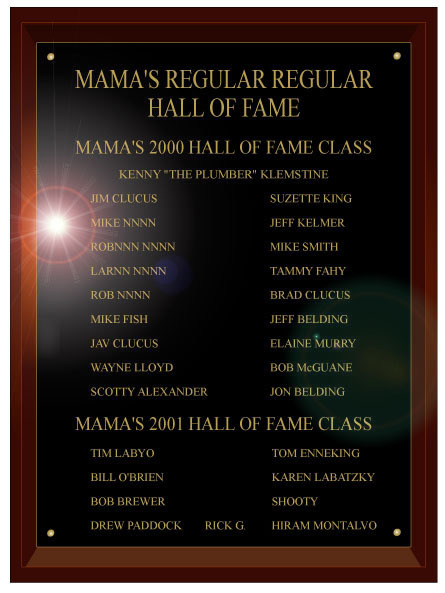 Every December at the Mama's annual X-mas party, we induct new members into the Hall of Fame. Regulars have always been a key part of the success of Mama's. This is indeed one of my favorite nights at Mama's. Fifty people yelling and screaming when a new inductee is announced. All of the members in the Hall of Fame get to cast 2-3 votes for possible inductees each year. As one regular said, He did not know if should be honored or not being put into a bar's hall of fame, but I consider it a privilege to induct some of the best quality people I have ever met into Mama's Hall of Fame. Do you have potential? You need some serious face time to be considered!!!!!! !